It’s official. The City of Orlando entered into an agreement with Cyclehop on Nov. 17 to allow bikeshare stations on city right-of-way starting with the OUC building, Gertrude’s Walk (west of the rail road track), Skyhouse (near Orange County Courthouse), and Lake Eola (near Central Blvd. and Osecola) by year end. On tap is an additional 16 locations by March 2015. 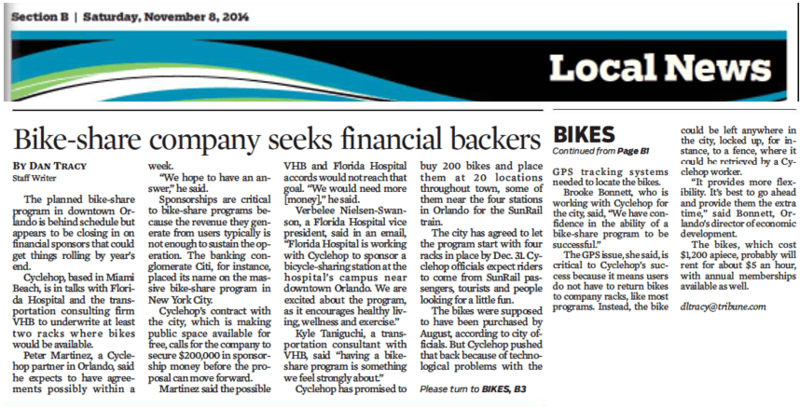 The Orlando Sentinel reported that Florida Hospital and VHB moved fast and claimed sponsorship titles at two locations and, according to the Cyclehop website, there are a only a few sponsorships left. As for individual riders? Membership starts at $30/month or $79 for the year, giving you one free hour a day. To get the full scoop and details check out the Cyclehop website.